According to the Duluth Minnesotian, performance art (of questionable quality) first arrived in Duluth on June 4, 1869, via the sailing vessel Meteor, which brought “some kind of ‘fat woman’ stage show.” That same year George P. “Big” Hanson built Duluth’s first theater, the Theatre Shed (aka, the Pine-Clad Shed, the Pine Shed, the Opera House, and the Political Wigwam), on the northeast corner of Superior Street and Second Avenue West. It was a simple affair: the stage had no curtain, and patrons sat on plank benches. It changed hands after Big’s wife shot him dead in Iowa (a jury acquitted her and commended her self-defense skills). In 1871 the Shed hosted the first Shakespeare production in Duluth; some have suggested it also hosted prostitutes and their patrons. William Branch purchased the Shed in 1872, tore it down, and planned to build a three-story brownstone opera house on the same location. 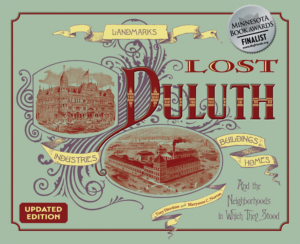 But when the Panic of 1873 struck Duluth, construction stopped when the building was still only two stories tall. Community members then provided entertainment performing at Branch’s other building on Superior at Fourth Avenue East. The Panic didn’t stop the 1873 construction of the Dramatic Temple on the southwest corner of Superior Street and Second Avenue West, a two-story theater with a five-hundred-seat auditorium on the second floor and a restaurant on the first. It became the Duluth stop for traveling theater troupes. As Duluth began to thrive in the 1880s, investors saw the need to entertain the growing population. In 1882 the Duluth Theatre went up on the west side of Second Avenue West, just off the Superior Street alley. It was out of business by 1884 but reopened as The Parlour by new owner Ole Olson, who had run a theater/saloon of the same name just south of the Duluth Theatre. His establishment was more of a gathering place that also offered entertainment than a dedicated theater. Duluth’s more “refined” citizens frequented the Grand Opera House, the Temple Opera House and the Lyceum Theatre beginning in the 1880s. After 1910 the Orpheum and Grand (later Lyric) theaters provided Duluth with the nation’s best vaudeville acts. Smaller theaters came and went along the way, some in their own buildings, others in buildings originally designed for other purposes. (While the theaters are gone, some of the buildings remain). The Metropolitan Opera House opened in the heart of the Bowery on Christmas Day, 1902. Despite booking top acts, it didn’t fare well: Duluth’s well-heeled theater patrons avoided the Bowery, whose residents couldn’t afford the Metropolitan’s prices. By 1907 it had ceased to book legitimate theater and became a burlesque house; it was gone by 1910, replaced by the Soo Line Passenger Depot. The lower side of the 100 block of East Superior Street hosted several theaters over the years. The Bijou Theatre stood at 12 East Superior Street and operated as part of the Sullivan and Considine vaudeville circuit from 1903 until 1911, when it became the Empress Theatre. The Empress burned in May of 1915, and the building was converted for retail sales; it is now home to the Electric Fetus. The Strand, at 16 East Superior Street, was built in 1906 as a meat market, but by 1915 it was showing movies and did so until 1951. The building stood vacant until 1971, when it reopened as an adult theater. It closed again in 1986, remaining vacant until its 1998 demolition; the lot is now part of a condominium complex and medical offices. Various theaters moved in and out of the Wieland and Hayes buildings at the eastern end of the block over the years, including the Star in the Wieland and the Savoy at the Hayes during the first decades of the century. The Lake Theatre occupied the Savoy location from 1935 to 1950 and operated as the World Theatre from 1950 to 1956. The Sunbeam, a dedicated movie house and “high class amusement enterprise, catering especially to women and children,” opened at 109 West Superior in 1908, but in 1922 it moved to 103 West Superior Street and the New Astor Theatre took over its previous location. The Sunbeam was gone by 1930, and the New Astor ten years later, replaced with Snyder’s Drug. The Rex Theatre at 18–20 Second Avenue West was built in 1913. Over 1,000 patrons could be seated in its auditorium and balcony. In 1925 its name was changed to the New Garrick, and in 1940 it was modernized by the Minnesota Amusement Company. The building was razed in 1956, replaced with a parking ramp; the building next door is still called the Garrick Center. 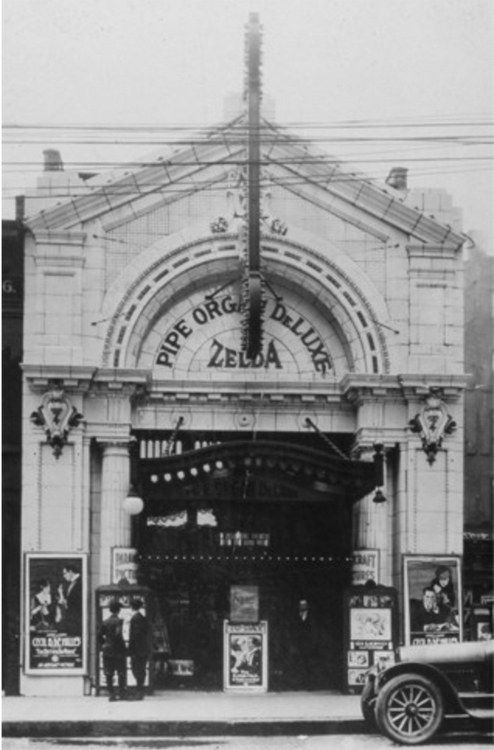 The Zelda Theatre was housed at 311 West Superior from 1914 until 1927, when it was replaced by the Zelda Inn and later Boyce Drug Store. The building became Peterson-Anderson Florists in 1985. Other lost downtown Duluth theaters include the Happy Hour at 129 West Superior, the Diamond (originally at 124 East Superior and later at Superior Street and Fourth Avenue West), the Kozy at 419 East Fourth Street (not to be confused with the Kozy Bar and Apartments in the former Pastoret Terrace at 129–131 East First Street), the Granada at 109 East Superior Street, as well as the Colonial, the United States, and the Astor. Downtown Duluth wasn’t the only place to take in a play or movie. West Duluth had at least three theaters. The Alhambra showed films at 321 Central Avenue from 1913 to 1926; it opened for a year as the State Theater, then closed again in 1928. The Doric at 5715 Grand Avenue opened in 1925 with seating for 800. In 1955 the theater closed and the building was remodeled as an office complex. The West, built in 1937 at 317 North Central Avenue, was primarily as second-run movie house. After a 1966 remodeling it was renamed The Duluth and showed popular movies that stayed in theaters for months, such as The Sound of Music and Doctor Zhivago; later it showed a variety of films, including some considered pornographic. In newspaper ads it was sometimes referred to as the “Duluth Spirit Valley Theatre;” it is a quilt shop today. In the West End, the Majestic Theatre at 2021 West Superior Street operated from 1907 to 1912. The West End Star Theatre opened at 2110 West Superior Street in 1908, moved across the street to 2110 West Superior, and operated until the early 1950s; the building then became a furniture store. In the east, the Lakeside Theatre (sometimes referred to as the Lakeside Art Theater) stood at 4619 East Superior Street from 1934 until 1970 when it was converted into a medical clinic; it became Lakeside Medical Center by 1978 and Duluth Clinic in 1982. In 2008 it was razed to make room for a new medical clinic. In the early 1950s Duluth was served by twelve movie houses; by 1959, when the Lyric closed, it was down to just four: the NorShor, the West, the Granada, and the Lyceum. In the 1960s and 1970s movie houses sprung up in new retail developments and drew heavily from downtown audiences, and a few of the dedicated theater buildings that still stood were converted into adult movie houses. The Lyceum was destroyed in 1966, and the Granada became an adult bookstore until it was demolished in 1987. Various attempts to keep the NorShor operating after its initial 1982 closing have included showing movies. Today the Marcus Duluth Multiplex Theatre next to the Duluth Entertainment and Convention Center shows first-run movies and downtown’s Zinema 2 shows current and art house films.